Claude and his best friend, Sir Bobblysock, a very bobbly sock indeed, set out on an adventure and make a splash in the city. 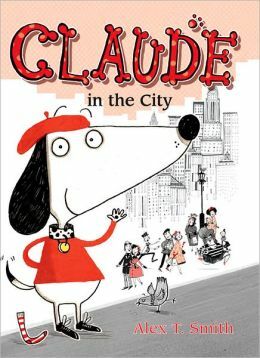 Claude, a dog with a long face and a beret, lives with Mr. and Mrs. Shinyshoes, who leave Claude and Bobblysock alone every day. After the humans take off for work, Claude blocks traffic because he doesn’t understand horn blowing. He examines groups of pigeons. He finds a shop with many kinds and colors of berets and buys every possible combination. He goes to an art gallery and foils an art thief. He is the hero of the day and is recognized by the mayor, though Mr. and Mrs. Shinyshoes don’t understand how. Next, Claude takes a trip to the hospital in an effort to find out what’s wrong with Sir Bobblysock. At the hospital, Claude is recruited to help a group of wrestlers suffering from a mysterious illness. Of course, all is well at the end. Imaginative and exciting illustrations are important parts of this story. As a dog, Claude doesn’t talk much, but he has many expressions. The themes of pure silliness, humor, and striking out on your own fit in well with the second grade reading level. There is enough repetition to aid in comprehension, but not enough to get tedious. For more fun and reading activities, check out Smith’s blog at http://alextsmith.blogspot.com/, which includes his sketchbook, or Claude and Bobblysock’s own blog at http://claudebooks.blogspot.com/. Apparently, Claude’s fans like to dress like Claude and have their own Sir Bobblysock.